There are very few studies assessing the best approach to investigate severe asthma in the paediatric population. Clinical consensus suggests the following tests may be useful for confirming a diagnosis, ruling out differential diagnoses, monitoring disease severity or identifying contributing co-morbidities. Standard spirometry is limited by the child’s ability to perform a dynamic airway manoeuvre. Generally, children aged over 5 years can perform spirometry. Children with severe asthma may have a normal FEV1 between exacerbations (van den Wijngaart et al. 2015). 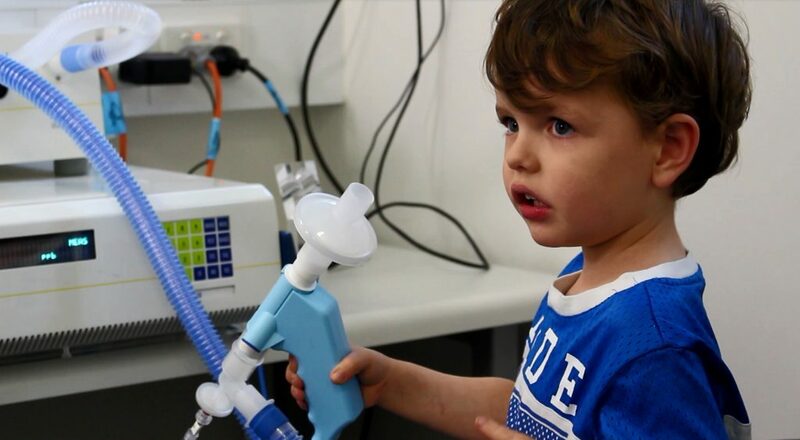 Children with poorly controlled asthma may adapt to prolonged impaired lung function and report feeling ‘fine’ despite poor lung function, hence spirometry is essential in children from 5 years of age. NOTE: In children with poorly controlled asthma, lung function may be poor with little or no bronchodilator responsiveness. Poor bronchodilator responsiveness is also typical during a viral exacerbation. Primarily a measure of large airway patency, while peripheral airway disease is more important in severe asthma. PEF can be useful in children with poor perception of airways obstruction or dysfunctional breathing (van den Wijngaart et al. 2015). Can be useful in confirming bronchodilator response (BDR) in children that cannot perform spirometry. Bronchodilator response is defined using the 5th/95th centiles of the response to bronchodilators in healthy populations. These have been reported to be between −33 and −42 % for Rrs, 61 and 70 % for Xrs and approximately 80 % for AX, irrespective of the dose of the salbutamol (Hall et al. 2015). Interpretation of test results requires clinical correlation (Shi et al. 2013, Schulze et al. 2016). The main value of FeNO in children is as an assessment of adherence. FeNO levels drop quickly following inhaled corticosteroids (ICS) use, so ongoing high values on FeNO may indicate poor adherence. A normal value supports an alternative diagnosis or non-eosinophilic inflammation causing asthma. There is very little evidence to support the use of FeNO as a monitoring tool over standard care, in children with severe asthma (Gomersal et al. 2016). True treatment refractory severe asthma in children is rare, so exclusion of alternative diagnoses should be considered, especially if treatment adherence has been assessed to be good [See Management in Paediatrics]. Bronchoscopy and chest CT scans may be useful and effective investigations to exclude alternative diagnoses, particularly if there is a history of chronic productive cough, poor response to bronchodilators or steroids or previous severe respiratory infections . During bronchoscopy, bronchoalveolar lavage can be performed for microbiology, cell counts, and to investigate for lipid-laden macrophages to exclude infection and aspiration, respectively. Visualisation of the airways during dynamic breathing may diagnose bronchomalacia, as a cause of recurrent cough or wheeze. Low or normal dose CT chest is usually sufficient, but HRCT may be required to exclude interstitial lung disease, if clinically suggested (e.g. persistent hypoxia or diffuse changes on chest X-ray). Cardiopulmonary exercise testing has a role in clarifying other differential diagnoses and contributing comorbidities. May be useful to exclude the diagnosis of primary ciliary dyskinesia, if symptoms of chronic or recurrent wet cough are present. May be useful to exclude the alternative diagnosis of cystic fibrosis, if symptoms of chronic or recurrent wet cough are present.